This is exactly the same tuning as D major but you have to tune each string up a whole tone. It is a good idea to be able to pitch the tuning wherever you want as a lot of old blues tunes use this tuning but pitched at all sorts of different notes. They didn't have tuners in the old days so if you want to play along with old slide pieces you have to be adaptable. 1. Hitting the note (E) on the fifth fret 2nd string and not getting the sound of the fifth fret chord - this involves lots of practice of R/H damping and/or using just a bit of the slide to hit the note. 2. Jumping from the second string to the fourth string avoiding the third string completely. 3. 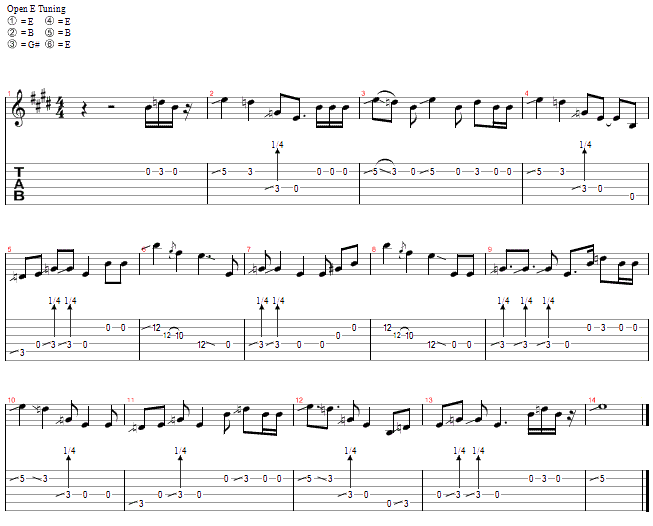 Jumping from playing at the twelth fret to the third fret and open position. Take it slowly and try one phrase at a time.